The home health OASIS insight you need to accurately complete the assessment the first time, every time! 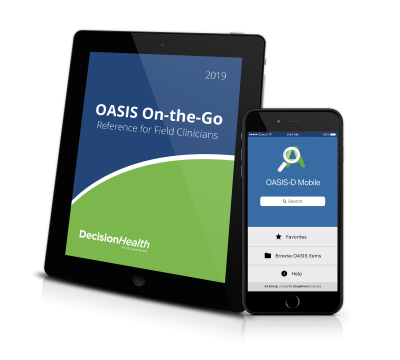 OASIS On-the-Go Reference for Field Clinicians is the electronic book that goes beyond the instruction found in the OASIS Guidance Manual, providing black-and-white interpretation of the many gray areas plaguing home health agencies in OASIS-D. OASIS On-the-Go comes with a companion OASIS-D Mobile application for both iOS and Android devices (tablets or phones) that provides tips extracted from the eBook and pairs them with the official guidance found in the manual and online. OASIS-D Mobile allows you to access OASIS guidance anywhere, anytime – even while visiting patients in remote areas with unreliable, or even nonexistent, WiFi. *Immediately following checkout, a link to the (1) OASIS On-the-Go PDF and (2) instructions for downloading the OASIS-D Mobile app will be available in the My Download section of your account. You’ll also receive an email with your new OASIS-D Mobile app login information. But note, your OASIS-D Mobile login and password will be the same information you use to log into the DH Store. 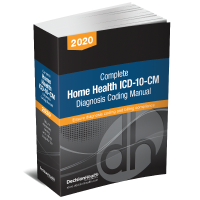 For multiple order discounts, please contact Gary Belski at 1-855-225-5341 x6012 or gbelski@decisionhealth.com. Step 1: Immediately following checkout, a link to the (1) OASIS On-the-Go PDF and (2) instructions for downloading the OASIS-D Mobile app will be available in the My Download section of your account. Note: If you haven’t already created an account for the Store, you will need to before you can access this section. Your login and password for the Mobile app will be the same information you use for the Store. We’ll send you a confirmation email for your order as well. IMPORTANT: Please check your Spam or Trash folders if this email does not appear in your Inbox. If you’re using your healthcare agency email address for registration, often the email security will reject this email since it is from an unknown source. If the user does not receive this email within 24 hours, please contact Customer Service at 1-855-CALL-DH1, and we will update your Profile and provide you with a new password. Step 2: Once you’ve downloaded OASIS-D Mobile from the App Store or Google Play Store, login to the App with your Email Address and Password. Remember, your login and password for OASIS-D Mobile will be the same information you use to log into the DecisionHealth Store. Forgot Password? Should you forget your password, click “Forgot Password” at the login screen; the “Reset Password” link will be sent to the email address associated with the user. Note that the link will be active for only 24 hours and can only be used to reset the password once. You must contact DecisionHealth customer service to update the email address associated with your user account. Need Help? Call Customer Service at 1-855-CALL-DH1 (1-855-225-5341).